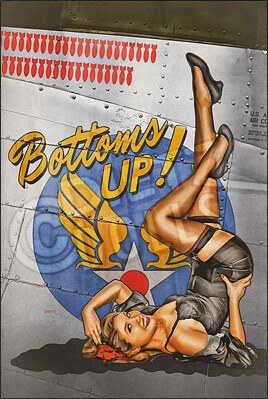 Shalyah in this fictional Consolidated B-24 Liberator pinup titled 'Bottoms Up'. It's hard to think of World War 2 aircraft without envisioning the classic pinup Nose Art of the time. Pilots and crew would adorn the nose, engines, and sometimes even waist or tail of their aircraft with rather colorful artwork giving the aircraft not only a name, but a personality. Accompanying catchy slogans, ironic phrases, or names of loved ones back home the Nose Art was often completed with a pinup girl. The Nose Art pinup girl found herself in all sorts of situations, and most of the time she would be devoid of clothing or be in the process of losing said clothing due to some unfortunate event. The pinups would often be direct copies of pinup girls produced by the pinup artists of the time... George Petty, Vargas, Al Moran, Gil Elvgren, and more. The Dietz Dolls Nose Art Pinup series celebrates the classic pinups that appeared on the sides of World War 2 aircraft. It could be said that nose art was one of the major causes for the boom in pinup popularity, and the timeless image of a pinup gracing the nose of a warplane has become as iconic as the war itself. With the threat of death at every turn, the pilots and crew would use these nose art pinups as their motivation of what's waiting for them back home. These Nose Art Pinups prints in this series are carefully edited to match the same painted texture styles and put on authentic WW2 aircraft, suitable for framing and a perfect gift for those in the service past and present! Notify me of updates to Bottoms Up!